RBG is an understandably affectionate biography of 85yo Ruth Bader Ginsburg, the frequently dissenting liberal Justice in the conservatively weighted US Supreme Court, whose life-long legislative pursuit of gender equality has elevated her to icon status. The most inspiring and uplifting film of 2018. I wasn’t much interested in seeing this doco, partly because the title, RBG, and the person whose initials those are, meant nothing to me. It’s a fair bet that if you’re not American you don’t know who ‘RBG’ is, either. Let there be light. ‘Notorious RBG’ (a play on the handle of fellow Brooklynite, rapper The Notorious B.I.G.) 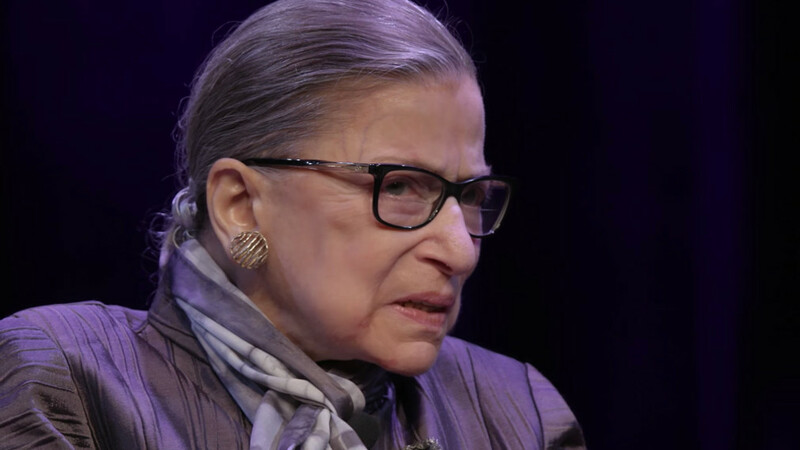 is the moniker pop culture has bestowed on 85-year-old Justice Ruth Bader Ginsburg, eloquently dissenting liberal in the conservatively weighted US Supreme Court. Her notoriety derives from the frequency of her dissenting – as does her status as a liberal icon. And praise be for her! But there’s more. A lot more. Relentlessly pursuing gender equality throughout her long legal career, Ginsburg has brought about legislative adjustments that have literally changed America, especially for women. And she’s done it quietly, respectfully, working tirelessly within the legal system, her lethal weapons being concise, reasoned argument, an undeviating and uncompromising sense of fairness and justice, and patience. At one point, she likens her efforts to have the all-male jurists of the 70s see that women were indeed discriminated against to teaching kindergarten kids. She now finds herself lauded as a feminist hero. Gloria Steinem goes further, labelling her a super-hero – and by the time the film ended, I could but agree. Ginsburg is bemused and amused by her celebrity status. Indeed, reserved and quietly spoken, this diminutive dynamo is about as unlikely a prospect for mass-embrace as ever there was. Two of her friends who go right back to school days recall that she was always ‘serious’, and didn’t ‘do small talk’. They marvel at her energy, as well they might. On top of her judicial duties, she has overcome two bouts of cancer (one of which was pancreatic – who survives that? ), works out with a personal trainer, regularly attends opera (she is shown in costume in a short speaking role during the staging of one opera, bringing the house down before an adoring New York audience), and has raised two children – some feat from a professional so driven that at one stage in her career she was sleeping 2 hours per night. Behind this great woman is a great man – her adored and adoring, endlessly supportive extrovert husband Marty, who was content to play second fiddle to her career at a time when that was virtually unthinkable, taking on the cooking and other domestic and family duties while still managing to establish himself as one of New York’s leading tax lawyers. Their mutually nurturing love story – one for the ages – is one of the main threads of the film. Marty’s final love letter, written on his deathbed, is most affecting – a highlight. As docos go, RBG is probably nothing special structurally or cinematographically, although I was too immersed to note or care about stuff like that. The directors, Betsy West and Julie Cohen (incidentally, fittingly, the entire film crew is female), are unashamed fans of Ginsburg. Their respect and esteem for her as one of the most influential women in America’s history is contagious, and Ginsburg herself does the rest. She’s irresistible, and so is this film. In fact, it is far and away the most uplifting and inspirational movie of 2018. Sorry, but I’m going to get didactic and evangelical here. You NEED to see RBG. Ginsburg is one of the great women of our age, not just for her achievements as a warrior for gender equality, but as a role model (SJWs note: you’re doing it wrong). You should know about her.